The idea that there are many ways to get to Heaven is partly based on the assumption that there are various ways to gain its entrance. Some of the more common ways being baptism, good deeds, honest living, giving to charity, church attendance, and, if nothing else, by making a sincere effort. To most, the way to Heaven is broad, with many paths leading there. However, one has to wonder: if Heaven is so relatively accessible, then why did Jesus Christ die on the cross? Why did the only begotten Son of God come to earth, take on flesh, and allow Himself to get spat upon, punched, mocked, kicked, humiliated, whipped, and then literally nailed to a cross in the hot Judean sun to die a bloody death The Apostle Paul states it best when he says, “And I went up by revelation, and communicated unto them that gospel which I preach among the Gentiles, but privately to them which were of reputation, lest by any means I should run, or had run, in vain.” Galatians 2:2 KJV You see, Jesus died for a very important reason. He claimed, “Jesus saith unto him, I am the way, the truth, and the life: no man cometh unto the Father, but by me.” John 14:6 KJV His sacrificial death provides the only way to Heaven. “I am the door: by me if any man enter in, he shall be saved, and shall go in and out, and find pasture.” John 10:9 KJV That means Heaven!Jesus said, “Verily, verily, I say unto you, He that entereth not by the door into the sheepfold, but climbeth up some other way, the same is a thief and a robber.” John 10:1 KJV Further more, when His disciples asked, “Strive to enter in at the strait gate: for many, I say unto you, will seek to enter in, and shall not be able. When once the master of the house is risen up, and hath shut to the door, and ye begin to stand without, and to knock at the door, saying, Lord, Lord, open unto us; and he shall answer and say unto you, I know you not whence ye are:” Luke 13:24-25 KJV Now, obviously, many of you reading all this will still find it hard to believe that there could only be ONE WAY to get to Heaven. IT’S SIMPLE! The only payment for sin that God will accept is the shed blood of Jesus Christ. However, what most people are trusting in to pay for their sin and get them to Heaven DOES NOT INVOLVE DEATH! For example, during baptism no one dies.During confirmation or communion no one dies. During any good deed you and I perform NO ONE DIES; NO BLOOD IS EVER SHED! Do you see now why Christ is the only way to Heaven? It says it here in the Bible , “For the wages of sin is death; but the gift of God is eternal life through Jesus Christ our Lord. And from Jesus Christ, who is the faithful witness, and the first begotten of the dead, and the prince of the kings of the earth. Unto him that loved us, and washed us from our sins in his own blood,And hath made us kings and priests unto God and his Father; to him be glory and dominion for ever and ever. Amen.” Romans 6:23, Revelation 1:5-6 KJV If we fully place our TRUST IN HIS DEATH, AND SHED BLOOD, our sins will be payed for and we’ll be allowed in Heaven. The Bible says, “That if thou shalt confess with thy mouth the Lord Jesus, and shalt believe in thine heart that God hath raised him from the dead, thou shalt be saved.” Romans 10:9 KJV So we need to see first that, if we are ever to enter the kingdom either in its present or future manifestation, then we must change. We must be converted. There must be a transformation. Have you been converted? Has God changed you? 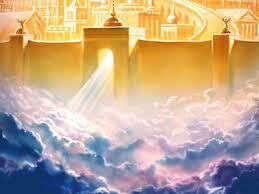 “At the same time came the disciples unto Jesus, saying, Who is the greatest in the kingdom of heaven? And Jesus called a little child unto him, and set him in the midst of them, And said, Verily I say unto you, Except ye be converted, and become as little children, ye shall not enter into the kingdom of heaven. Whosoever therefore shall humble himself as this little child, the same is greatest in the kingdom of heaven.” Matthew !8:1-4 KJV Unless you change from what you are into what this child is, you cannot even enter, so how can you claim to be the greatest?” Pride is a great stumbling block. Proud people cannot enter the Kingdom of God. They cannot give up their own preeminence for His. Jesus did not have to call a child over to make His point. He could have just said, “Humble yourself as a child.” But He did not. So there is a significance to calling the child over and having him stand in the midst of them. Only after this was done did Jesus say, “Become like this child, or you cannot enter the Kingdom.” So what is the significance? Jesus called the child, and the child responded to Jesus. There is no questioning from the child, such as, “What do You want?” or “Who are you?” Jesus had him stand in the midst of them, and again, the child complies. We do not hear him say, “Why?” or “What are you going to do now?” or “I don’t have time to stand here, I want to go play.” The greatest people in the Kingdom are the ones who do what I tell them to do, nothing doubting. It is only when we get older that we begin to question everything. To enter this Kingdom we must know there is only room for one Head, for one Preeminence, for one King, for one Lord. We are disciples, not masters. We may struggle and question His dealings with us, but if we progress in the Way then one day we will learn the best course is to bow our heads and say, “Yes, Lord.” We are waiting for Jesus to give us grand instructions and commandments: “Go around the world and proclaim the Gospel full-time” or “Rise up and fulfill the ministry of an apostle” or “I have appointed you to be a prophet to the nations.” But if we cannot hear and obey in the small things, how can we expect Him to lead us into greater things? IT’S SIMPLE! The only payment for sin that God will accept is the shed blood of Jesus Christ. However, what most people are trusting in to pay for their sin and get them to Heaven DOES NOT INVOLVE DEATH! For example, during baptism no one dies. During confirmation or communion no one dies. During any good deed you and I perform NO ONE DIES; NO BLOOD IS EVER SHED! Do you see now why Christ is the only way to Heaven? It says in the Bible, “For the wages of sin is death; but the gift of God is eternal life through Jesus Christ our Lord. Jesus Christ, washed us from our sins in his own blood,” Romans 6:23, Revelation 1:5 KJV If we fully place our TRUST IN HIS DEATH, AND SHED BLOOD, our sins will be payed for and we’ll be allowed in Heaven. The Bible says, “That if thou shalt confess with thy mouth the Lord Jesus, and shalt believe in thine heart that God hath raised him from the dead, thou shalt be saved.” Romans 10:9 KJV FIRST, you must realize that what keeps you from going to Heaven are your sins, because, “But your iniquities have separated between you and your God,” Isaiah 59:2 KJV In fact, in God’s eyes YOU ARE A SINNER, “For all have sinned, and come short of the glory of God;” Romans 3:23 KJV SECONDLY, you must realize that there is NOTHING you can do to save yourself and earn Heaven, “For by grace are ye saved through faith; and that not of yourselves: it is the gift of God: Not of works, lest any man should boast.” Ephesians 2:8-9 KJV Baptism, good deeds, church membership, self-righteousness are all examples of good works that cannot save you, because, “Not by works of righteousness which we have done, but according to his mercy he saved us,” Titus 3:5 KJV THE ONLY WAY you can get saved is through Jesus Christ. He said, “I am the way, the truth, and the life: no man cometh unto the Father, but by me. while we were yet sinners, Christ died for us.” John 14:6, Romans 5:8 KJV THEREFORE: You must REPENT, change your mind, admit that you are a Hell deserving sinner and can’t save yourself. And call upon Christ, and Him alone, to save you. It says it here in the Bible, “That if thou shalt confess with thy mouth the Lord Jesus, and shalt believe in thine heart that God hath raised him from the dead, thou shalt be saved. For with the heart man believeth unto righteousness; and with the mouth confession is made unto salvation.” Romans 10:9-10 KJV The Scriptures tell us that the Lord Jesus is “full of grace and truth.” With Truth comes Grace, and we will now conclude with how God accomplishes this impossible work by Grace. The Lord is waiting for us to know and to confess, “I cannot”. For He can do what we cannot do; and He will do what we will not do! And once we allow Him, He brings us to where He wants us to be in a most remarkable manner. The Bible says, “I am the door: by me if any man enter in, he shall be saved, and how can we know the way? Jesus saith unto him, I am the way, (Path)” John 10:9,14:5-6 KJV Lord Jesus Christ, I thank You that You are my Way, my Truth, and my Life! I praise You that I cannot save myself. You are my Narrow Gate, and You are my Narrow Path. As I am decreased, You are increased, and my life is exchanged for Your Life. I thank you, Lord, that through You we may enter the Kingdom. Amen. WHAT THE BIBLE SAYS ABOUT STAYING “FOCUS” – KEEPING YOUR EYE ON THE PRIZE – KEEP YOUR EYE ON JESUS !! In this passage in Matthew, we see something that is very significant. Jesus had preached and, as usual, had attracted a large crowd. Five thousand men, besides women and children, had gathered to hear Him, and He not only taught them, but He also fed them all, possibly as many as ten thousand people through a miracle of provision. After He had fed them, He sent them away, and instructed His disciples to get into a boat and go out onto the Sea of Galilee while He Himself went to be alone to pray. While Christ was in prayer, the wind became boisterous, and the waters of the sea became severely troubled. But in the fourth watch of the night, He went out to the boat, walking on the water! When the disciples, who were, I’m sure, already very concerned about the weather, saw Him, they were frightened, and thought they were looking at an apparition! Knowing this, Jesus said “Be of good cheer,. it is I; be not afraid!” Peter, always the first to speak up, good or bad, said “Lord, if it be thou, bid me come unto thee on the water!”. So Jesus instructed Peter to come on out to Him. Peter, following Christ’s instruction, proceeded to go out to Jesus, and he too was walking on the water! But when Peter realized what was going on, and saw that the wind and the waves were tempestuous, he was afraid, and began to sink down into the water. Peter immediately cried out to the Master, and Jesus stretched out His hand to catch him. And as Jesus caught him, He said “O thou of little faith, wherefore didst thou doubt? ” Jesus then took him, and they got into the boat, and when they did, the storm immediately ceased, they were immediately to the other side of the sea. And they all worshipped Jesus, saying “Of a truth thou art the Son of God “ It is to our loss as believers, that so oftentimes we forget the simplest teachings of the Scriptures. Peter was able to walk on the water by faith, until he took his eyes off Jesus, looking at the storm’s tempest instead. What a truth! So often we take our eyes off the Lord, because of troublesome co-workers, marital difficulties, rude people, unfair situations, life’s problems, et cetera. The lesson is simple—keep your eyes on the Lord and you won’t go under! When we find our self in these situations-frustrated, discouraged, and angry because of people—we need to focus our eyes once again upon the Word of God, i.e., the Lord Jesus Christ. It is quite easy to lose sight of one’s Christian beliefs, when overshadowed with adversity and grief. It can be overwhelming at times. People can be so cruel. In 2nd Timothy 3:1 KJV ” This know also, that in the last days perilous times shall come.” This verse warned us that “perilous times” would come, when people would be… lovers of their own selves. The majority of Americans today have become selfish, self-conscious, and self-centered. Sadly, America’s Christians aren’t much better. The Biblical account of Peter walking on the water to Jesus, is one of the first lessons which Sunday School children should learn, and a lesson which every adult Christian should never lose sight of. When we focus our thoughts upon the divine Truths of God’s Word, we are able to withstand the attacks of Satan. The Bible says, “Wherefore take unto you the whole armour of God, that ye may be able to withstand in the evil day, and having done all, to stand.” Ephesians 6:13 KJV You see, our Lord has gone up. And we are left here below to face the storm. Yet, we do not have to face the storms of life alone; He is ever with us. It says in the Bible, “Wherefore he is able also to save them to the uttermost that come unto God by him, seeing he ever liveth to make intercession for them.” Hebrews 7:25 KJV As long as we hear His Voice, and obey His Word, we will be on top of the troubled water, or, on top of the storm – the situation that troubles us – we will be on top of LIFE. But when we take our eyes off Him, and begin to go our own way, and focus on other things, we will begin to sink down into that which we are focused on. 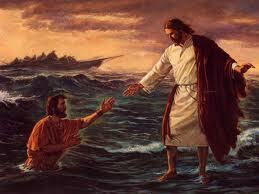 When Peter followed the Master’s instruction, He was on top of the water, as troubled as it was. But when Peter took His eyes off Jesus, and began to look at the troubled water all around him, he began to sink down into that water. What He was FOCUSED on began to CONSUME him! And it’s the same with you and me. You see, just as Peter sank into the troubled waters, we too will sink if we focus on the trouble that is all around us! Now, I know, there are many things out there to trouble the waters. There will be storms in life. But do not focus on the storm! Because what you are focused on will consume you! That is why we must keep our eyes on Jesus! Because as we are focused on Him, we will not be consumed by the storm, but will be consumed with our Lord and Master Jesus Christ and His precious Holy Spirit as He becomes more and more the centre of our lives! And when we are focused on and consumed with the central figure of all the ages, we will NEVER be shaken! The Bible says, “It is better to trust in the LORD than to put confidence in man.” Psalms 118:8 KJV We are indeed in a very troublesome time in the history of our people. Wickedness abounds, and the righteous are pressed down. The turbulent wind and the tempestuous waves are all around us on every side, and the trouble and hopelessness of our situation would seem to be almost insurmountable. Life is full of storms. What are you going to focus on? We must be as determined as Job was when he said, “Though he slay me, yet will I trust in him: but I will maintain mine own ways before him.” Job 13:15 KJV No matter what happens, we must remember that God is absolutely SOVEREIGN, and that the rulers of all nations and kingdoms of this world are but pawns in His Hand, to accomplish that which He desires. Don’t focus on the troubled water, and be consumed by it! Live your life according to God’s Word, keep your eyes on Jesus and put your trust in Him, and you’ll be on top of the troubled waters! Because right out there in the middle of all that trouble is the ROCK OF AGES, and He’s a FIRM FOUNDATION! This makes me think of a spiritual principle in the Bible. Instead of concentrating on the sins we want to avoid, we are told to focus on the positive actions Christ desires for us. “Set your mind on things above, not on things on the earth.” We are to discard old ways of thinking and acting and “put on” new ways of living. When Christ and His interests are the focus of our lives, the lure of the old life remains in the corner of our eye, while we aim to land squarely in the center of God’s will. This music video details the events which occurred on September 11, 2001, the reaction to the attack, as well as its consequences. This is a tribute to all 2,998 people who died that day, as well as those who responded to the scene to help (who are still suffering from health complications to this day). Please be respectful. I encourage everyone to share the video, and use it for whatever purpose they desire. We all need to remember what occurred on that day, and to learn from this tragedy.